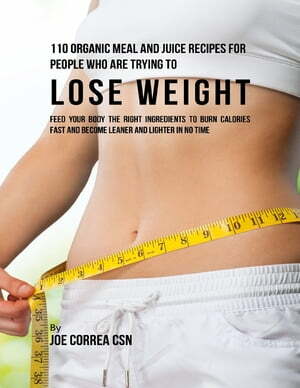 Collins Booksellers - 110 Organic Meal and Juice Recipes for People Who Are Trying to Lose Weight: Feed Your Body the Right Ingredients to Burn Calories Fast and Become Leaner and Lighter In No Time by Joe Correa CSN, 9781387168736. Buy this book online. Being overweight is a serious health problem that often leads to different chronic diseases especially diseases related to heart, blood vessels, and diabetes. Despite the undeniable fact that a healthy lifestyle is being promoted like never before, experts say that by 2025, more that 50% of the population in the USA will be obese. In my own experience, the hardest part can be creating a proper mental state, and keep yourself on the path of weight control. Dealing with extra weight can be mentally and physically exhausting, especially because it takes a longer time to lose all that weight. Extreme diets are unnecessary, you just have to eat what your body needs not what it wants.